Dr. Obourn was born and raised in Victor, NY. She married her high school sweetheart Dr. Peter Obourn, who is now a Sports Medicine physician with the University of Rochester. She attended Grove City College in PA, obtaining a Bachelors in Molecular Biology in 2007. Dr. Obourn complete medical school education at SUNY Downstate Medical Center in Brooklyn, NY in 2012. 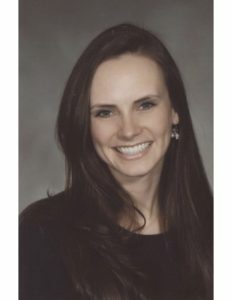 In 2017, Dr. Obourn completed her residency training in Head and Neck Surgery at Geisinger Medical Center in PA. She was subsequently honored by being chosen for a prestigious fellowship in Facial Plastic and Reconstr uctive Surgery under the directorship of Dr. Edwin Williams III in Albany, NY. Dr. Obourn is a board certified Head and Neck Surgeon and has completed fellowship training in Facial Plastic and Reconstructive Surgery. Her interests include surgical and non-surgical facial rejuvenation, rhinoplasty, skin cancer, and skin care. She is very excited to join the Lakeside group and offer an array of functional and cosmetic Facial Plastic and Reconstructive procedures. Dr. Obourn has authored or co-authored numerous publications, with a focus on Facial Plastic and Reconstructive Surgery. Several of these can be found online through PubMed.